Type S.A.2. 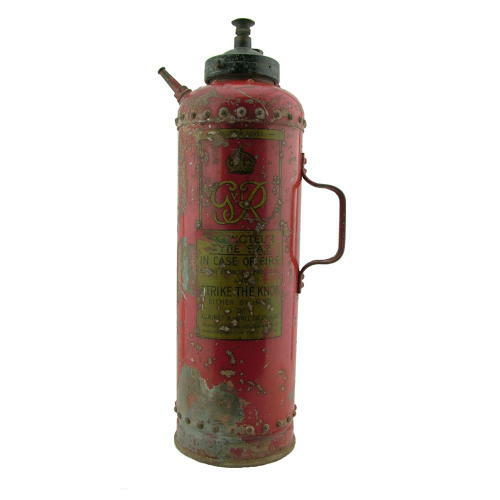 Red painted metal cylindrical fire extinguisher with handle to side and brass nozzle on the opposite top edge. The cylinder is approximately 56cm tall x 18cm in diameter (25cm including the handle and nozzle). Gold painted King's crown and George VI cypher plus wording ' EXTINGUISHER TYPE S.A.2. IN CASE OF FIRE REMOVE EXTINGUISHER FROM STAND AND STRIKE THE KNOB EITHER BY HAND OR AGAINST A WALL OR PILLAR. Tested to 350LBS per square inch,. Manufactured in the Year 1941'. There are some dents, paint loss and surface wear in places but overall condition is reasonable. Empty and sounds like it has some dry (rust?) deposits inside. Although not Air Ministry marked this has a wartime date and is the type of fire fighting equipment found on airfields and in wartime factories etc. Although rather worn it has a very pleasing patina and makes a great display piece. The Imperial War Museum have one the same in their collection. Heavy. Stock code M22644.